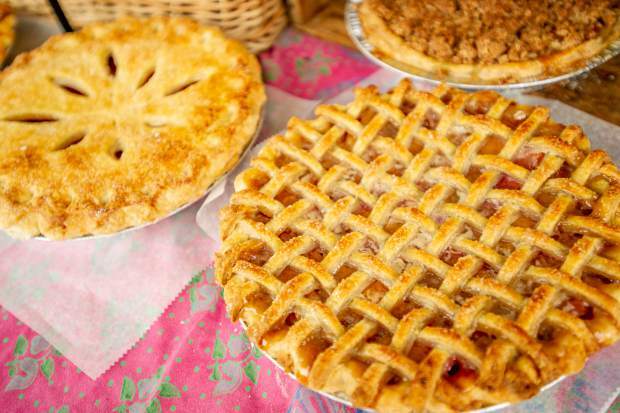 Pies, quiche, and pastries spread out at the Mountain Oven booth out of Paonia at the last Aspen farmers market for the season on Oct 6. 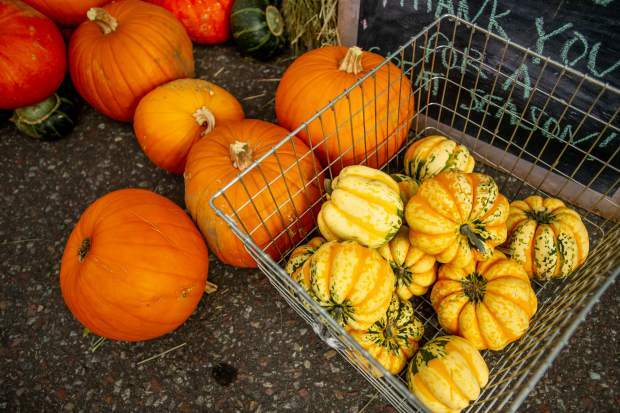 Fresh produce at the last farmers market for the season in Aspen on Oct. 6. Dana Whitcomb serves patron Alyssa Barsanti at her Mountain Oven booth out of Paonia at the last Aspen farmers market for the season on Oct 6. Andrew Gagnon measures out a bag of lettuce at the Borden Farm booth at the last Aspen farmers market for the season on Oct 6. Aspen Kettle Corn owner and 4th grade teacher Jeff White at the last farmers market in Aspen for the season on Oct. 6. 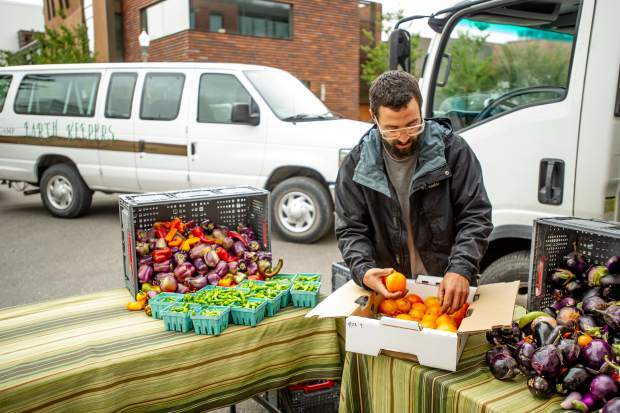 David Sutula of the Zephyros farm and garden booth sets up at the last farmers market of the season in Aspen on Oct. 6. 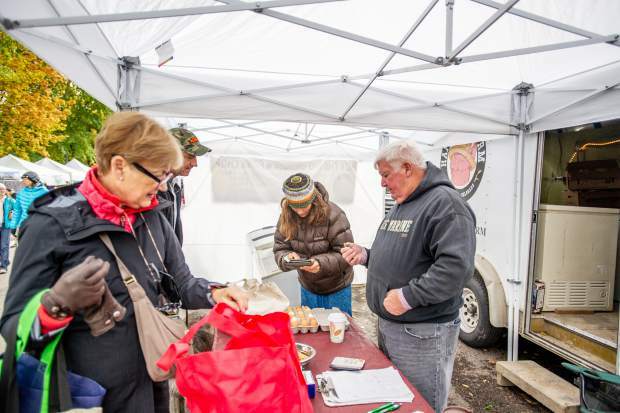 George Burkhardt, owner of Homestead Meat in Delta, helps customers at the Aspen Saturday Market. 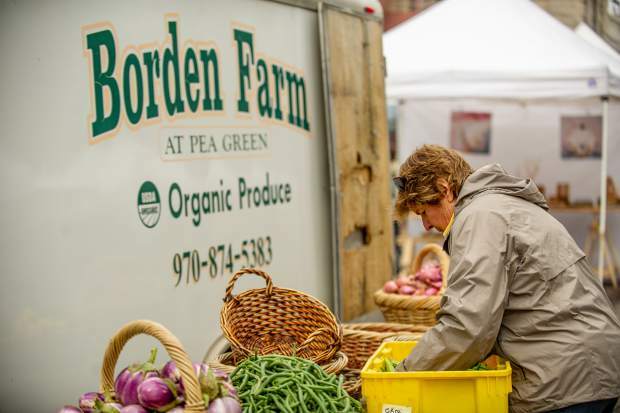 Pam Cunningham unloads produce for the Borden Farm booth at the last farmers market of the season in Aspen on Oct. 6. 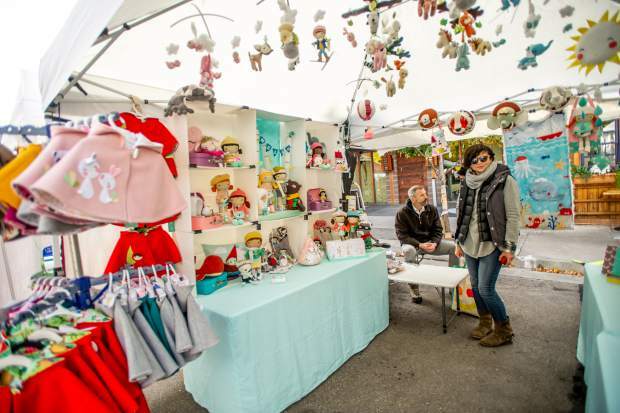 As clouds hung low over the mountains and the morning temperatures hovered near freezing levels on Saturday, vendors at the Aspen Farmers Market unpacked their wares for the final time this season. 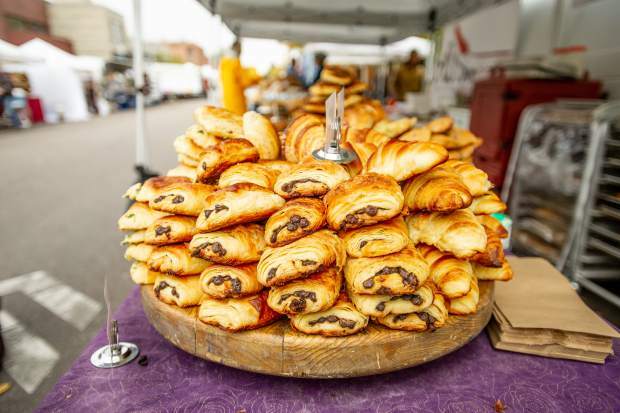 And now the artisans, farmers, florists and bakers will take a break from the hectic life of outdoor markets before settling in for the winter in preparation for next season. Down the street and around the corner, Andrews’ daughter, Reyna, watches her elementary school teacher Jeff White stir up a pot full of kettle corn. White, who has been making kettle corn at the market for the past 13 years, said he’ll now turn his attention to the classroom — and his daughter’s soccer games. The same goes for Chris Stoner, an Old Snowmass resident who owns Wild Bear Bee Farm. 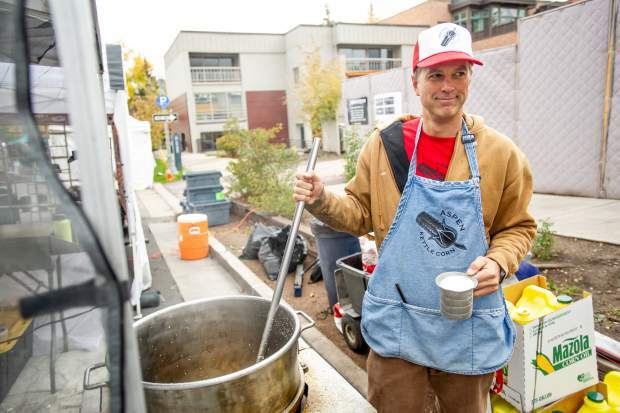 She’s been selling her honey at the Aspen and Basalt markets for the past six or seven years. With honey season from May to October, Stoner said she’ll fill her days hopefully substitute teaching and helping her husband, Todd, manage the cattle ranch he runs. Unlike Andrews, who has a brick-and-mortar jewelry and repair store on Cooper Avenue, the bulk of the business happens between June and October for Missen Brucker. She’s been selling her jewelry for 16 years at the market. Brucker said she will begin making inventory in January to prep for next season. “For me, I take two months and restore the creative process,” she said. Brucker is not alone in taking a welcome hiatus. The growing season is a busy one for Borden Farms. 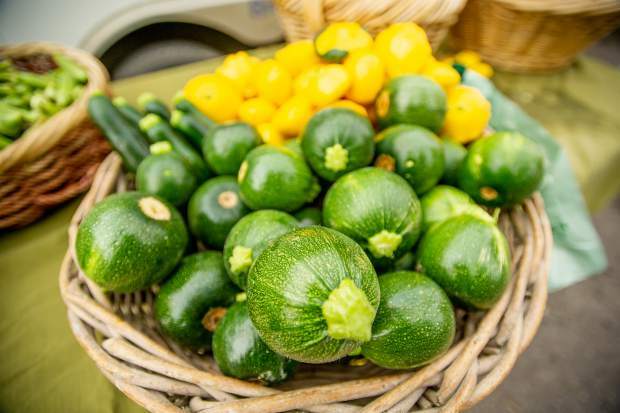 They have a presence at farmers markets around the state and participate in cooperative CSAs (community-supported agriculture). David Sulta, who works at Zephyros Farm and Garden in Paonia, said farmers markets require a ton of work. He said he won’t miss waking up at 3 a.m. to load up, drive here and spend two hours setting up and another hour breaking down. 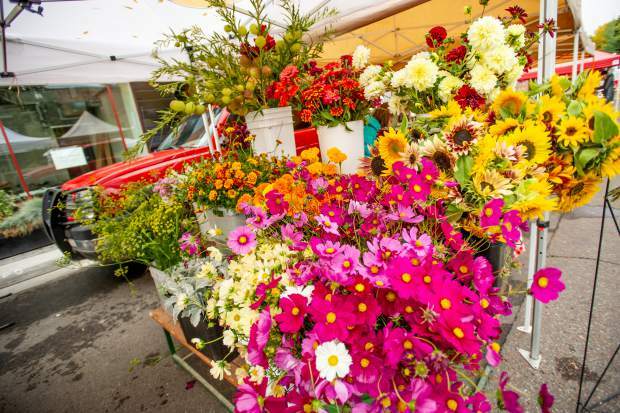 The organic farm also sells produce and flowers at the Telluride farmers market on Fridays. But the work doesn’t stop when market is over. Zephyros will dig up their agraila flowers and sell them wholesale throughout the winter. And seeding in high tunnel greenhouses begins in January to get a jump start on the growing season. Rebecca Wilson, owner of Cobalt & Curry who makes handcrafted bowls in her Carbondale studio, said it’s been a good season and she’s ready to return to a normal work day. Wilson, like the rest of the 99 vendors at the Aspen market, arrive sometimes before the sun comes up to set up their booths, tables and products. George Burkhardt, owner of Homestead Meat in Delta, stays at the Comfort Inn in Carbondale on Friday night to break up the trip from Ridgway, where he is at the farmers market during the day. Burkhardt said running a farm is a year-round business. “The farm never stops; you can’t just sit under a tree,” he said. Burkhardt has 700 chickens, as well as cows and pigs in three different stages of growth, and they all have to be fed and cared for. “They like to be scratched and petted,” he said. The chickens, which produce thousands of eggs a week, get to run around and play every day. And the pigs are fed raw milk, lettuce, arugula, pears and apples. “Being stress-free makes good pork,” he said. Throughout the year, Burkhardt supplies eggs to restaurants in Telluride and sells meat to customers who come to the farm and buy in bulk — a quarter, a half or a whole animal. 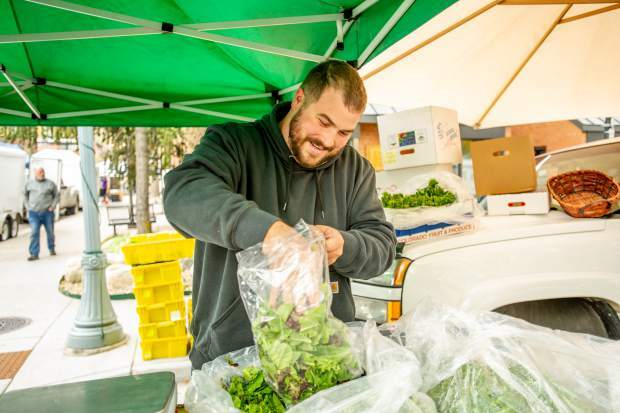 This year was the first farmers market for Joe Kyle, who gave up his job working at the Molly Gibson lodge and Hotel Aspen to be a full-time photographer. He uses the time outside of the market to go on expeditions to capture his large-format images. For his Capitol Peak photo that hung in his booth on Saturday, he said he camped out in an igloo at 12,000 feet. 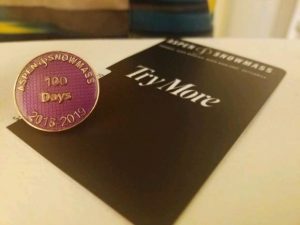 “It’s a short window of time to do the work,” he said, adding that he sells his images in the Aspen Winter Market, as well. This year was a first appearance for Chris Sullivan, owner of Mountain Oven, too. 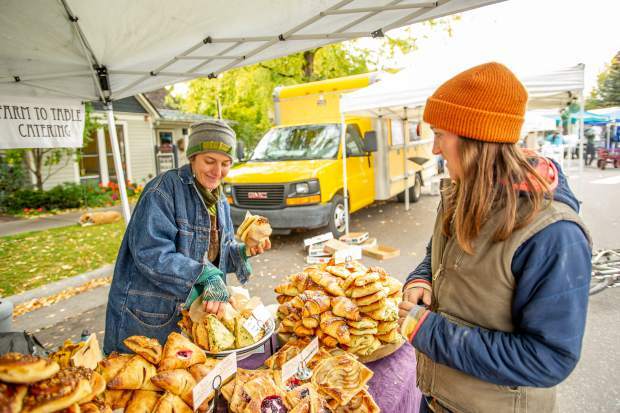 He moved his organic bakery from Crested Butte to Paonia to be centrally located for the Aspen, Crested Butte and Gunnison farmers markets. 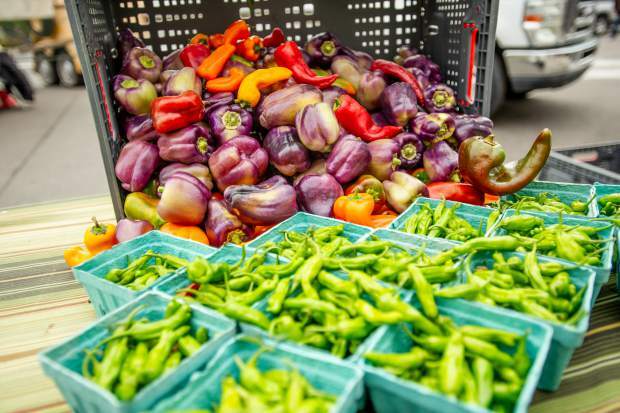 “Our kitchen works 24 hours a day to get ready for these markets,” Sullivan said. But the work doesn’t end when the markets do. Mountain Oven operates 12 months a year. 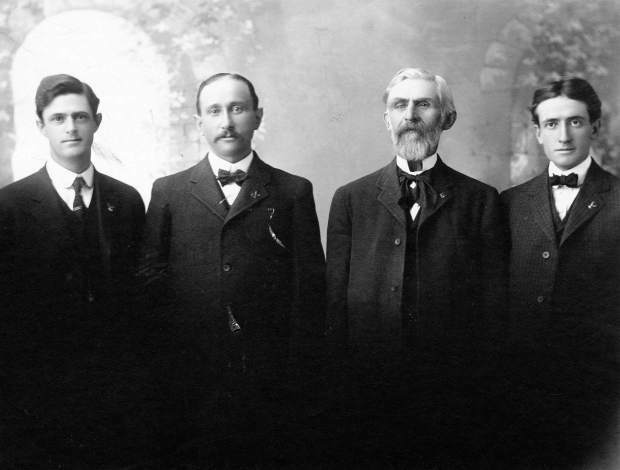 “Wholesale keeps us going and keeps people employed,” Sullivan said. 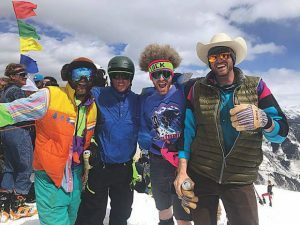 He said he hopes to have a presence in Aspen soon, in possibly a grocery store, coffee shops and a monthly distribution drop-off point. He said he’ll take a break through November but then it’s back to work. 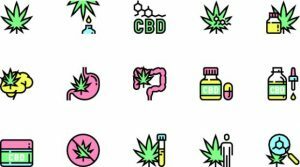 And one of the first tasks on the Aspen checklist is to submit the application by the December deadline. 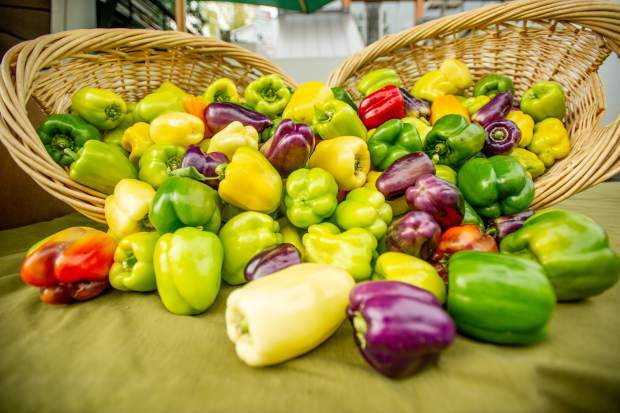 Farmers market manager Kathy Strickland said about 40 vendors were turned away last year. 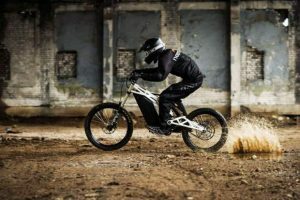 The market sells between $1 million and $2 million in merchandise annually.